That time I was so hungry I couldn't even get a picture of the food after it came out of the oven. I've seen Instagrams of baked chicken fajita, but most recipes I found used oils that were not Whole30 compliant. This is a super simple meal and makes great leftovers! Serves 3. 2. In a medium bowl, combine olive oil, cumin, red pepper flakes, oregano, garlic, and a dash of salt and pepper. 3. Put the chicken breast strips, peppers and onion in the bowl and stir with your hands to mix. 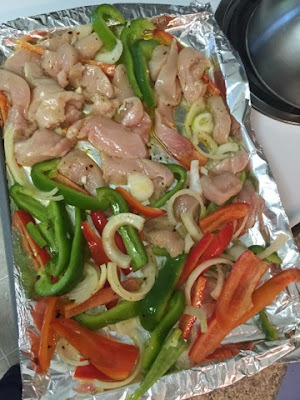 Spread the veggies and chicken out evenly on the baking sheet. 4. Bake for 20-25 minutes then enjoy! Obviously if you're not doing any paleo challenges you can eat them with tortillas. 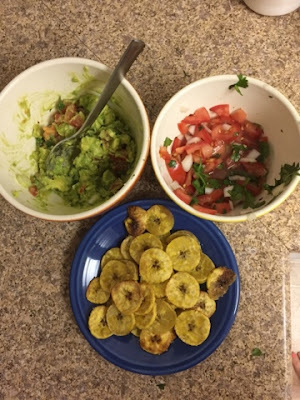 I ended up serving it with my guacamole, pico de gallo and Fed and Fit's plantain chips. Boyfriend approved! So today went fairly well. I got up early, got a workout in before work and had a productive day. Day 2 and 3 of Whole 30 is know as "the hangover." I did have a headache mid-morning, but after drinking some hot water with peppermint essential oil, I felt fine. The goal for Whole30 is to eat 3 solid meals per day that holds you over. With my job and commuting situation right now, thats not always possible. It would have been pretty hard to go 8 hours between lunch and dinner without any food. I bought a pack of RxBars because they are Whole30 compliant and pretty tasty. I keep some in my bag as emergency food and to tide me over if I'm going to work late. Similar to yesterday, I did feel very satisfied throughout the day. I did have to say no to some gluten-free cookies, but I didn't have any major cravings. Also my grocery bill is astronomically larger than usual. I'm going to do some of the math and see exactly how much more I spent in a week.